Both the main defending champions Jeremy Powers and Katie Compton will line up as race favourites for the US Championships in Austin, Texas on Monday evening (European time) after Sunday's race schedule was postponed. There'll still be live coverage of the exciting day's racing via Behind the Barriers TV. Here's our little preview of events Stateside. THE huge US championships began on Wednesday January 7th and the national singlespeed titles were the first to be contested in Austin, Texas over what was then a dry course. Mo Bruno Roy won the elite women's race whilst Justin Lindine won from the 135 starters in the men's race. 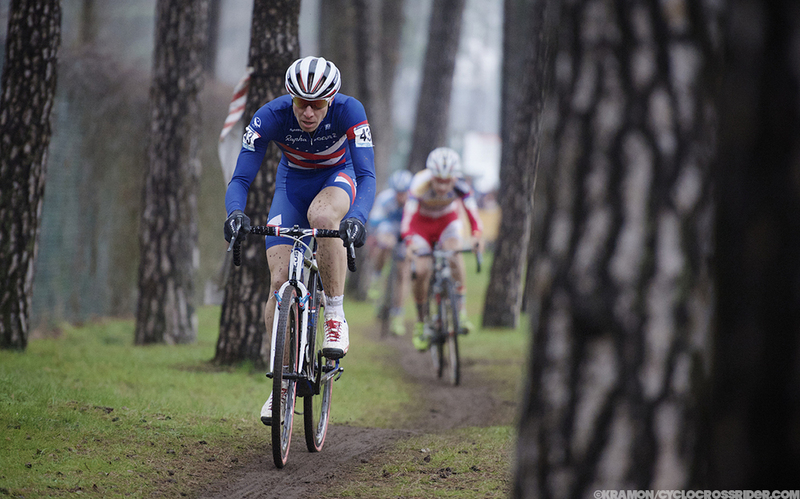 The defending elite men's champion Jeremy Powers (above) spoke to Cyclocrossrider a few days ago and told us that going into Sunday's (now Monday's) race he's feeling "Strong. Well-prepared, and mentally ready to defend." This is the first time the racing has been held in Zilker Park for many years (we understand that it may have even hosted the National Championship back in the 1970s), so the venue and course are entirely new for practically everyone. Powers, however, told us, "I was here in August for some CX Camps and was able to preview the course then. So I knew the key features of the venue ahead of time which was nice. It's fast and technical, with a lot of off-camber sections. No one is really sure how it will hold up under rain and mud. Rain during Friday and colder temperatures have made today's - Saturday's - racing conditions much worse and that's something that Powers is not afraid of. "There is a potential for a very technical race with a lot of mud, which is exciting, and something I'm well-prepared for given all the European racing I've done this season," the two-time US champion told us. One rider who may be able to spring a surprise on Powers is his former team mate, and former American Under-23 champion, Zach McDonald (below) who was on good form in the Resolution Cup last weekend. The championship race is sure to be action-packed and Europeans please note that it's perfect entertainment for your Monday evening after you've perhaps enjoyed your own national championships on Sunday! Four-time champion Jonathan Page is also expected to go well in soggier conditions, with all his European experience, and he'll be looking to take home one of the medals. Sadly missing from the race will be triple National champion Tim Johnson who has been announced as a non-starter although he did put together a great course preview that we've shared below in the update section. KATIE Compton has won an amazing ten American senior cyclocross titles and despite being the favourite again in Austin it is also perhaps one of her most vulnerable years. Her season is Europe has been dogged by allergy issues and the sad sight of her struggling with her breathing. It's understood that the allergies may be damp and mold-related so she's been preparing for Austin in drier surroundings in the States. Compton has not actually been beaten that many times this season (certainly not many times by Americans), but then she has raced very sparingly. Katie only raced once in the whole of December - when she finished third in the World Cup in Namur which was indeed her last race - some three weeks ago. If Katie has a bad day then there are a number of riders, like the on-form Crystal Anthony or Rachel Lloyd, who will be all too eager to take advantage. Meredith Miller has withdrawn with an ankle injury. Racing began on Wednesday with some non-championship events and the singlespeed categories. Thursday, Friday, Saturday and early Sunday morning features the various age group championship races. Venue: Zilker Park, Austin, Texas. We'll also have a special Austin Photo Gallery for you on Tuesday. Friday: Conditions could worsen with coming rain plus Course Preview and Tips with Tim Johnson. Saturday: It's getting muddier and more rain fell on Saturday evening. Welcome to Day 4 of #CXNats, brought to you by #mud #fun and #cowbells Mother Nature smiled upon those crazy #Cross fans today for sure! #FujiCrossIsBoss and more in the mud!